Congratulations to the winners of the 2018 European Language Label Awards, or ELLAs! Representatives of nine innovative projects collected their awards from Minister of Education and Skills Richard Bruton TD at a ceremony in Croke Park Conference Centre on 25 September. More photos from the day are on our Facebook page. An Foclóir Aiteach is a resource for those who wish to use the Irish language to refer to themselves. It also aims to educate everyone regarding the existence of the LGBTQI+ community in Ireland, and also their right to space and recognition in the Irish Language. A group of parents and grandparents who want to use and progress their own Irish while helping children with their school activities. 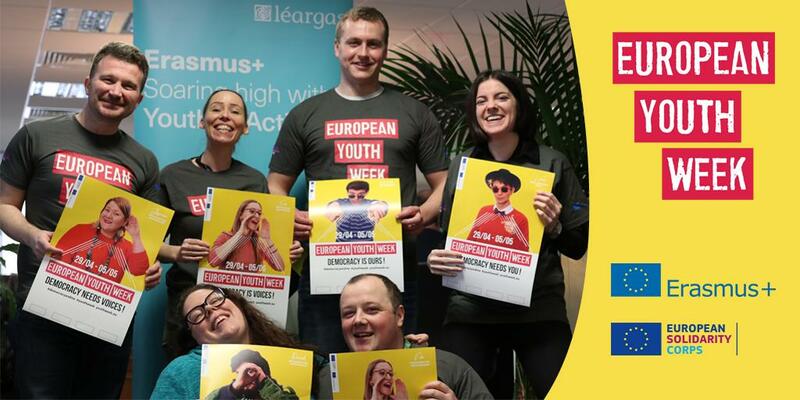 The project aims to promote health and well-being through the development of Irish language skills, and also look at language development for further foreign language learning with adult learners. An after school Language and Culture Club in Maynooth Post Primary School. Designed primarily to support the home/heritage languages of international students and to encourage students to engage more dynamically with their home languages. Parents are trained as volunteer mentors to support language learning as part of the project. This project provides English language, social integration, vocational and social orientation, intercultural and active citizenship training to those in need. It builds a sense of community between the new-Irish population and the local community in Dublin. It not only alleviates loneliness and isolation for the learners but provides an opportunity for the local community to reflect on the importance of language and the human story. A dedicated multilingual multicultural space that offers a welcoming environment for communicating in languages other than English. Intercultural interactions help overcome shyness, prejudice, intolerance, and the fear of moving beyond a familiar English-speaking environment. A language awareness programme for primary school children that provides equality of access and esteem to children irrespective of their social, cultural or religious background. There are discussions around languages and the value of languages as well as fun activities to promote trying many new languages. This project uses IT technologies to facilitate virtual language exchange between five schools in Ireland, Germany and Spain through the medium of the Spanish language. It focuses on the joy of connection with others throughout Europe. Its aims included motivating language learners through building personal connections, sharing cultural richness, sharing laughter and joy through teaching local dances through Spanish. There are over 50 different languages spoken in St Mark’s School. This was a linguistic diversity awareness programme which included a survey of languages spoken, producing a video, a multilingual magazine, presentations and posters. Project aims included encouraging students to develop and maintain literacy in their first language as well as peer teaching of the student’s first language. Talk Nua is a blog that provides support, information, language development strategies and advocacy for parents raising multilingual families. It particularly helps those who have children with special educational needs. The blog hopes to challenge long-held false beliefs about multilingual language development and children with special needs.